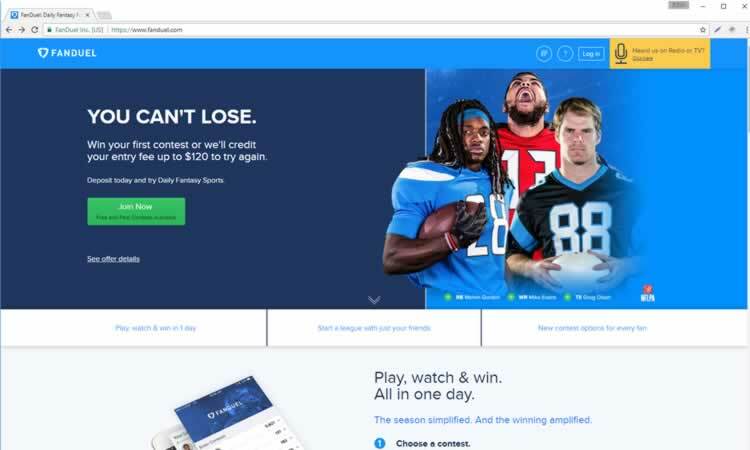 How FanDuel Works – FanDuel for Dummies and err… You! So you’ve heard about Daily Fantasy Sports and you want to play. Well this guide to FanDuel, walks you you through every aspect of the rules, the games and the prizes and how to play. Before you play for real money, you’ll have to fund your account. Clicking “add funds” (top right hand side of the screen) will take you immediately to a bonus page where you can choose one of four bonuses, or even customize your own. I’ve already deposited and taken my bonus so I don’t have a screen shot of that. You’ll then be asked for either your credit card details (VISA, Mastercard or Discover) or you can also deposit via PayPal – enter the amount you want to deposit and you’re ready to go. Head to Head – You’ll take on just one opponent and the higher scoring player of the two will win the cash. Leagues – A league is a smaller contest which is either made by a user or FanDuel which would need to fill in order to run. 50/50’s – These are events where half the field will win money, the other half won’t, but with more entries than a head to head. Tournaments – Tournaments are larger events and are guaranteed to run even if they are not filled. Entries – The number of players who have entered so far. Size – The maximum amount of entries there can be in the event. Entry – This is the amount in dollars you’ll have to pay to enter. Prizes – This is the total prize fund. You’ll notice it is clickable, and clicking brings up the individual prizes for different finishing positions. Starts – This is the time that the event stars in EST. You’ll notice that on some events there are either one or two different symbols to the right of the contest name. G with a blue background – This signifies a guaranteed prize pool, meaning the prize is set, regardless of whether the tournament fills or not. M with an orange background – This signifies a multi-entry event. You’ll be able to enter this contest more than once. You’ll also find that some contests are called “satellites”. These are not events in their own right, but offer tickets to other bigger contests. The satellite will tell you how many seats are up for grabs in the name – “2 seats” meaning you’ll have to finish in the first two to be successful in the satellite event. Clicking the enter button on the far right hand side obviously means you’d like to take part in the contest. When you enter a contest you have to pick the players who will be representing you that day. 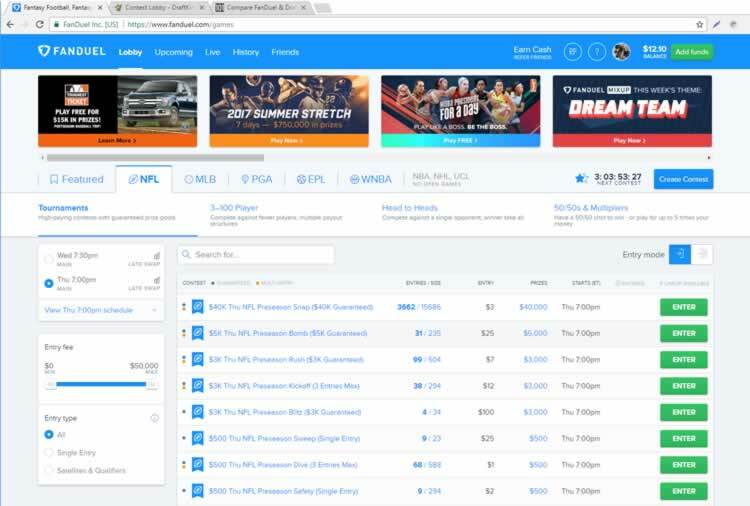 The way FanDuel works is by giving players a total amount of salary to spend on your roster – each player in the league having a different salary. The better the player is expected to perform on a given day, the higher salary they will command. Depending on the sport, you’ll have different positions to fill on your roster, and you’ll not be allowed to go over your salary – if you do, you won’t be able to submit your entry. You’ll be able to monitor how your roster is faring throughout the day, and FanDuel will update the leaderboard of every contest after any points are scored. The contest will finish when the final game of the day is over, and the leaderboard at this point will be the final one. If you have finished high enough to finish in the money, your account will be credited automatically. Want to play? Visit www.FanDuel.com and use promo code FREAK when you sign up to lock in a 100% deposit bonus. Beginner’s guide to Fanduel Baseball.